I found his tweets an interesting "window" into the madness, it seems clear the centre-core fountain of his bad information is broadcast ABC media. I don't come on here much as I used to but its amazing what's out there on Youtube and it seems like every professional person out there is on Twitter and has a point of view or even expert analysis of what's going on out there. I saw one expert break down how a lot of LCE charts you see that are in any way in favour of Wind/Solar are pretty much fake made up garbage, but I will have to go digging for the link for those interested, in reality just use your common sense and look at real-world retail prices next to those with the most wind turbines in their states that actually try to rely on them like South Australia and Germany. Then there is "trusted sources" like ABC news and BOM which is the Australian government Bureau of Meteorology ( https://en.wikipedia.org/wiki/Bureau_of_Meteorology ) for watching the weather etc in Australia, but these guys have been caught countless times simply lying their arses off about just about anything. And most recent was the claiming "all-new record hot temperatures in Adelaide" while simply ignoring older records. As far as I noticed leftist ABC gov funded broadcast media kept reporting this BOM "record" for a week like it was the 2second coming of Jesus, but it was baloney.. If all broadcast media was amalgamated into internet only media (no "broadcast spectrum privilege") then people would of been able to "click/tap" elsewhere and found it seconds it was rubbish/misleading information. To me, this is why I think there shouldn't be any major tech companies/broadcast companies stepping on "fake news" because in reality its almost all fake news one way or the other, the attack on fake news which really means "news the establishment doesn't like". It's a stepping stone to a truly dystopian world like 1984, I think with censorship we are watching one of the greatest tragedies of our modern world unfold before our eyes. Spectrum privileged Broadcast media is no good and "fake news simply because we don't like it + algo-privileged internet news" is equally as bad, there isn't really a true "free market" any more, just when the internet was taking over and there should be. Nothing that is deemed fake news should be deleted, being a compromiser I think at most a permanent "badge/marker" over something saying "Fake News" etc should be placed over the offending article but never removed, this way people still get to decide, otherwise its just pure 1984! Even though Electricitymap.org was deliberately set up to show off how great renewables are it ends up really just showing how great nuclear is. For example, Electricity Map deliberately underreports "installed wind-turbine capacity" of some states like South Australia by almost 40% to help make wind look more effective than it really is which is a "capacity factor" lie/cheat. The proof that the demand for wind/solar renewables is all politics is how ineffective it actually is at lowering co2 emissions. Only Nuclear based France/Sweden is GREEN on low CO2 emissions on Electricitymap most of the time. But Germany with its incredible 60GW (60,000MW) of wind turbines installed emitting on average 10xTIMES more co2, so its brown in color most of the time as shown in this chart. In fact you can see that despite all the wind/solar installed in most of world in this single Electricitymap CO2 chart that it doesn't matter who you are or even if you have Hydro which of course is a no-brainer that you MUST install if you can. 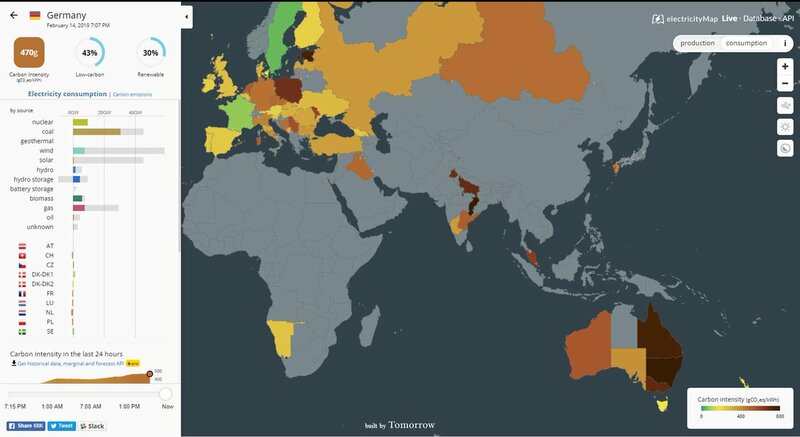 But fact is only Nuclear BASED countries effectively drop their co2 emissions on a useful level, as France and Sweden are the only two GREEN coloured countries on the electricitymap website. We hear so much "If we don't massively cut co2 emissions we are all going to die", but if you suggest nuclear and its crickets. 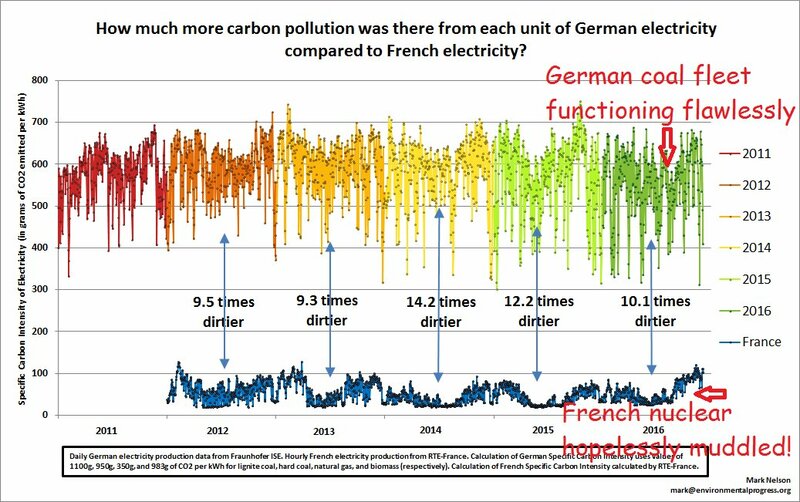 If we were comparing cars on emissions instead of electricity generation then any other "car" other than Nuclear based France would be considered a complete and utter joke at 10 times more co2.. Most people would consider a car that emits twice as much CO2 as the other car a complete joke in low emissions but we happily accept 10x times this for wind/solar renewables as a solution, its just a bad joke played on dumb people, no argument. 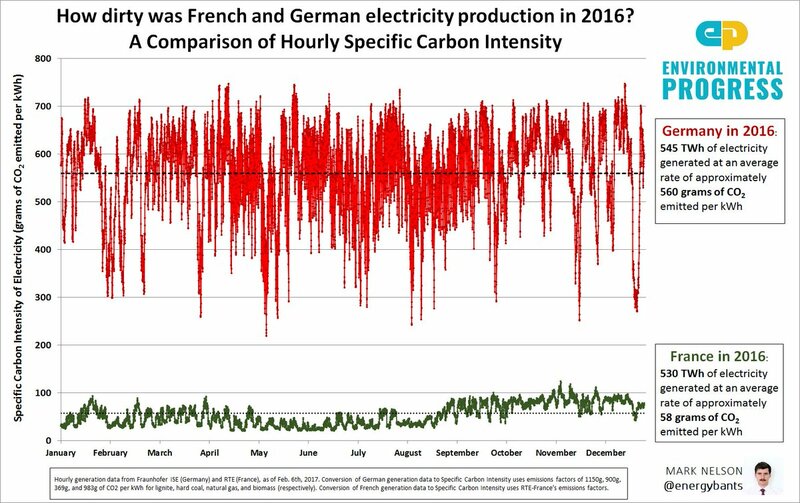 Multi year chart of co2 emission on Germany Vs France, Wind/Solar is just a horrible joke played on people for the sake of politics, political power gains and of course money, lots of money. Here is an example of the money from the renewable energy side of things, countless incredibly juicy articles like this out there on folks like Al Gore, here was one that came out yesterday. Al Gore’s net worth exploded from $2 million to an estimated $300 million. I been cleaning up my writeup/run through on what I think will be the biggest cheap energy with low co2 emissions tech that's got a lot of potential the Terrestrial Energy Molten Salt Reactor. This is truly 4th gen that has all that you could ask for from nuclear and none of the costs or problems. Probably the most other most notable interesting thing I have seen lately, that people have responded to, was the Bill Gates lashing out and basically accusing people of being retarded for believing in wind/solar+batteries as the solution. The problem (excluding if you calculate the stupid insane size of the battery needed to replace the grid) is the problem of trying to do this and include the general industrial complex that runs our 1st world lifestyles. There is no point of doing this if you don't have a job to go to in other words, most job needs energy, its probably why you have a job, usually lots more energy than you use sitting at home. I saw this video a little while ago and all up its pretty informative about Nuclear (but it demonizes coal hard), what I like about it is it shows you how little nuclear waste there is in reality with nuclear electricity generation (but not making bombs), also this small amount of leftover waste is now perfect for the MSR 4th gen reactor technology. Last edited by TheBeastie on Feb 19 2019 9:40am, edited 1 time in total. Just turn off your TV & computer and disconnect from the grid. Helps you, helps us. Living In The Future's Past movie. Amazing film making. Stunning cinematography and editing. Brilliant audio capture and music design. A complex story that needs to be contemplated by more people, more often. Essential concepts for all humans to understand going forward. Hagens has thrown together a series of short videos explaining energy/ economy/ psychology (ecology to follow next week) that his Dean of the Honors College at University of Minnesota pushed him to produce. Every incoming freshman is now required to view them. Last edited by sendler2112 on Feb 18 2019 2:00pm, edited 1 time in total. He had me at "leftist ABC gov funded broadcast media"
Did you watch the videos? Anyone? This is essential information that everyone in the world needs to understand if we want to make wise decisions going forward. It has been simplified and condensed down to the minimum time and difficulty level. Watch on 1.5 speed for the time/ attention span poor. Ill watch the vids and say what i make if it when I got five mins it may not be nice or pretty but I'll be honest. I've heard alot of enthusiastic people jump on concrete storage for solar and wind, but by the time we extract the energy from the wind or solar we then have to turn it back to mechanical energy when we lift the weight and then back to electrical when we lower it so the efficencys are piss poor. Solar with 25% would get under 5% of the original solar energy to grid offshore wind may improve that to just under 10% but thats only because solar panels are about the same as an onshore wind farm for total energy capture around 25% while offshore can be upto 40% of the wind energy captured. One things for sure we need energy storage and we need vast amounts of it no matter it's size as it's stationary but the conversion losses need to be improved. Last edited by Ianhill on Feb 18 2019 11:36am, edited 2 times in total. So I have to take that as a no. So sad. But I understand. It is human nature to suppress anything that challenges a current belief (that you already know everything and have no need to learn anything new). First of all, if you would bother to find out, most eco- warriors find nothing contradictory in anything Hagens is saying. No. I found a source that is putting forward a new synthesis of understanding on how the studies of energy, economy, ecology. and psychology fit together. Which was previously talked about by only a few and was not readily available until recently. If you really want to participate in the discussion, I recommend that you at least skim the material that is put forward here. And then you may intelligently refute it if you wish. If not, you may please feel free to ignore anything I write about. There is little more I can do about that. But your childish replies as above without even attempting to understand what is being presented, or your other personal favorite "one trick pony"
I have posted dozens of other essays and manifestos here. You are late to the party and didn't bother to read in. I don't have any subscription for TV, and pretty sure Australian ABC isn't broadcasting in Oregon And yeah, I like your definition better - public funded, as opposed to government. The Govmnt controls the public funding and decides how much the ABC budget is. Why do you make comments on things you have no knowledge of ? Why do you question my knowledge when you don't understand the point of my comment ? Yes, we have been there and done that previously...nothing new there ! The battery is making much money (from consumers) for providing sevices (FCAS) , ..that were not needed before SA introduced a high % of wind and solar generation. Just extra cost to a expensive power supply system . What happened when i bought a house with Solar already installed..
............just before we entered escrow, we learned the solar array hadn’t belonged to (the owner.) It was, in the language of the industry, a third-party-owner, or TPO, system, belonging to Sunrun Inc., the largest provider of residential solar in the U.S. I started looking into the TPO model. It’s used less often than it once was, but it’s been important in making residential solar, once out of reach for most people, much more widespread. The reason is simple: Homeowners usually pay nothing upfront. A company like Sunrun puts solar panels on your roof, connects them to your home, and claims a tax benefit for owning the system. Going forward, you pay Sunrun to provide the bulk of your electricity needs instead of your utility. Never buy a house with a PPA solar system. Insist the owner either remove it or buy it from the provider before the sale completes. .... By early 2018 the company was deploying more residential megawatts than any of its rivals. It’s gained market share every quarter but one since mid-2015, has 218,000 customers across 22 states, Washington, D.C., and Puerto Rico (California accounts for about half of them), and employs more than 4,000 people. Sunrun’s shares have nearly tripled in value in the past 12 months, and the company projects that its customer base will grow 30 percent in the current fiscal year. And not so far down the road is the new mandate in California. Jurich sees this as normalizing solar, making it feel less risky for homeowners to adopt. More specifically, she told me, it will be good for companies using the TPO model. Builders won’t want to offer solar as an owned part of the home because that will inflate the sticker price. Instead, she said, buyers will finance the systems via a separate transaction—one that Sunrun is in talks with the state’s 10 biggest homebuilders to provide. Sunrun relies on TPO for 85 percent of its business. Yep. And my advice stands - don't do it. Even if it's really popular to do. They must be preying on low income households because a fully installed system can be had for $3.5k. $4k if its completely unsubsidised. That's entirely manageable. Roof top solar is $3/ Watt installed without storage in the USA. $1.60/ Watt for the parts from mail order. Community gridscale solar is running $2.20.